The butcher made us six rib roasts for our customers. That’s a fore rib roast to the Brits and a standing rib roast to the Americans. In French terms, this is a roast made from the entrecôte of the animal. They don’t usually do this. Entrecôtes are for steaks! But I think the butcher did a good job with these. Rather than get confused in translation, I sent in the requirements for cutting the roasts in the form of this this video from Quality Meat Scotland. YouTube instructional videos speak louder than words. 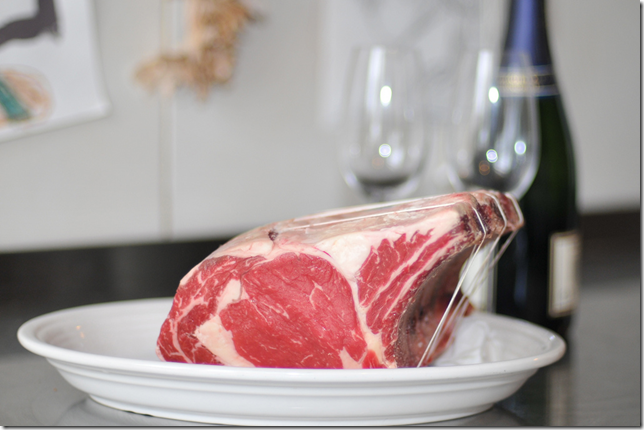 So due to the magic of the internet we have folks eating a grass-fed rib roast for their Christmas dinner. Those look very nice, we just had my wife’s family over for Christmas and I had bought and cooked a three rib and a two rib roast. I did that because one I wanted well done and the other I wanted medium. They turned out great, both moist and juicy but there is a lot of fat marbled through out. I wished it would have been grass fed beef so I wouldn’t have felt so guilty about eating it. Brent what do you charge per pound for your rib roast? That’s a great instructional video! (It also shows how the internet has sped up globalization!) I was wondering how you carve a roast like that, but I think the end of the video answered my question–between the ribs, I assume.